You can only choose one special grenade per class. Description: You get 2 Flash Grenades. These blind and deafen the enemy for several seconds, depending on how far away they are from the initial blast. If they aren't directly facing the grenade, the flashbang doesn't do much. If you see a Flash Grenade, try to turn around or get behind cover. Description: You get 2 Stun Grenades. This causes a mild flash that doesn't effect for very long. The Stun Grenades main purpose is to slow down your target for several seconds, giving you the chance to shoot or even melee them. If you get stunned and you saw where the grenade came from, try to shoot there, as the enemy will most likely try to rush in. 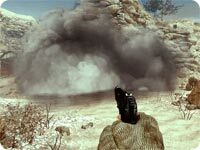 Description: You only get 1 Smoke Grenade that creates a concealing smoke screen. The Thermal Scope attachment can see through the smoke. Click on the image below for a better view.